Sit Back, Relax & Enjoy the Best View in Kissimmee! Sit back and enjoy one of the best views in Kissimmee! You will be amazed at the view from your pool area. Our vacation rental is a beautifully decorated, three bedroom, two bath home that backs on to a lake with a conservation area lush with wildlife. Share your breakfast with the eagles and alligators. Spend the day at the park or shopping and return to a solar heated pool (conventional heating also available). Relax and watch the Floridian sun rise behind the trees! This three bedroom, two bath home is decorated and furnished to a very high standard. It has a spacious, extended, double living area with sofa sleeper. The kitchen is fully-equipped, all linens are provided, and we have a local management team on hand to assist you with all you need for a perfect vacation in Florida. Creekside is ideally situated with Wal Mart 24 Hour Superstore just round the corner, and the World's #1 attraction, Disney World only 10 minutes away! Sea World and Universal Studios are 20 minutes by car as is Orlando International Airport. Sanford Airport is just 45 minutes. Please feel free to call for any more information about our luxury Florida home. A good stay at this home in Kissimmee. A spacious property with a lovely outlook. Lots of sun in the morning, shady in the afternoon. All amenities great, everything you could need, though bring your own pool/beach towels. The property was cleaned to a high standard and the management company ( and also a good friendly next door neighbour) were quick to respond to a pool pump problem. Would recommend for couples like us or a small family group. Thanks for a great stay. We thoroughly enjoyed our week in this delightful villa. Everything was as wonderful as we had hoped - clean, spacious, relaxing! We hope to stay here again on our next visit. Thank you for your review Joyce. We are very happy that you enjoyed our home and look forward to having you again in the future. Great Place to stay for our Family! Our family of 6 stayed here and were straight away impressed! only minutes away from the local supermarket and 20-30 mins from all the Universal and Disney attractions! The lake at the back was lovely to sit down and watch some wildlife in there natural habitat! Will definitely be staying again when we go out again next year!!! Just got back home after 2 great weeks at this beautiful house. Couldn't have asked for anything better. Top quality fittings, scrupulously clean, a great view of the creek and the woods. It really did have it all. 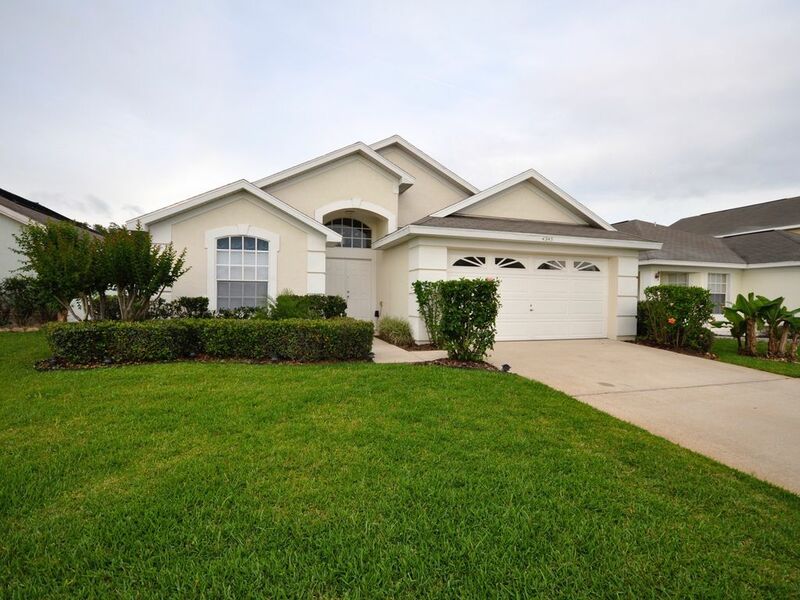 It is close to a Walmart, a host of restauarants and the Disney attractions, yet in a lovely tranquil area on a very well manicured and well kept estate. On top of that we got regular telephone calls from the owner to make sure everything was OK.
What a wonderful vacation spot! Very relaxing with a beautiful view of them lake and wildlife. I have to admit that I was skeptical to rent a house -sight unseen from someone I didn't know, but rest assured the owner Charlie, makes you feel so comfortable when he calls you that it takes the worries away. The house was even cleaner and nicer than expected. The pool was clean and 84 degrees the two weeks we were there. The kitchen was just remodeled with beautiful granite countertops and some new appliances a few days before we arrived. I will definitely rent this home again, it's 12 minutes to Disney & about 20 to universal - so easy to get to anything. The property management company was easy to get to and were very attentive. I'm already looking forward to renting this property again. We stayed here for a week late Oct/early Nov 2015. Creekside is a peaceful residential community area with easy access to the 192. Villa location means that you are not out in the middle of nowhere.For food shopping both Walmart and Aldi are 2 minutes away. Attractions are further afield but reachable in 20/30 mins depending on traffic. The villa is well equipped, spacious, comfortable with pool at the rear overlooking a small lake. Wildlife on display but no sign of the alligator, might have been on vacation! The owners, Charlie and Paul were a pleasure to deal with and contacted us whilst there to ensure all was in order. Management company collection of keys etc was all very straightforward. If you are looking for spacious accommodation in a peaceful area then this will suit you.